ORGANIZED workers sneered at the so-called labor agenda in the upcoming Asia-Pacific Economic Cooperation summit in Manila next month by describing it as deceptive and vague, which merely reaffirms APEC’s ideology based on the primacy of corporate power and profits over labor and trade union rights. Despite finally including “labor concerns” among the four official priority agenda in the APEC Economic Leaders Meeting (AELM) on Nov. 18-19 under “Investing in Human Capital Development,” it remains a lame and ineffective attempt to muddle the plight of the workers and to appease their growing discontent, Josua Mata, Sentro secretary general, said. “APEC is again using euphemisms and obfuscations – from the widely known business jargon of HRD or human resource development to its more recent clone of HCD or human capital development – to cover up its ulterior aim of levelling up the already rampant labor contractualization, which further swells the ranks of the ‘precariats’ or the impoverished and disempowered workers or proletariats with precarious jobs,” Mata added. “This corporate mumbo jumbo is part of the neoliberal alphabet soup on how to further enrich the global corporations and the few elites because HCD like HRD is still based on the capitalist or market economy’s twisted concepts on purported efficiency, competitiveness, profitability and workers’ discipline; thus, the need for more non-regular jobs, lower wages and benefits, and the reining in of the unions,” Mata explained. PFA 2015 acts as a parallel and alternative assembly to the official APEC gathering and highlights grassroots’ stand on workers’ and trade union rights; trade, investment and finance; climate and environment; social impacts on class, gender and empowerment; peace and security; and democracy and human rights. The AELM is being hosted by the Philippine government following its hosting of a similar summit in 1996 in Subic Bay Freeport, which was also hounded by protests from local and international anti-APEC and anti-neoliberal globalization groups. 1. In 1996, the Asia-Pacific Cooperation (APEC) summit met in Manila during the administration of Fidel V. Ramos. Then US President Bill Clinton was one of the leaders of the countries gathered at APEC. The summit was held at Subic Freeport, Olongapo City. 2. There were a number of progressive groups which protested against APEC and the neoliberal globalization that it represented. Two alternative conferences were held – one was Slam APEC (Solidarity of Labor Movements Against APEC) which was held in an abandoned factory of Rubberworld in Novaliches, Quezon City. This was joined in by a number of unions under the Bukluran ng Manggagawang Pilipino (BMP) and its allies in the labor movement and other sectors. The other one was the Manila People’s Forum participated in by NGOs and POs (people’s organizations) against APEC and its neoliberal agenda. 3. These two coalitions staged a long caravan which snaked its way from Manila to Olongapo City. It was blocked from entering the APEC Summit site in Subic. 4. The Ramos government’s propaganda on APEC and its agenda of ‘globalization’ focused on its role of creating more jobs, developing agriculture and industries, and therefore stimulating Philippine economy. The government boasted that foreign investments would hurriedly come so the Philippines can join the march towards globalization of the entire economy. 5. On November 18-21, 2015, the Philippines will host another APEC summit. The leaders of the 21 capitalist countries in Asia-Pacific, led by the US President Barack Obama, will meet in Manila. The countries or ‘economies’ belonging to APEC consist of the following: United States, Japan, Philippines, Malaysia, Indonesia, Thailand, Australia, Brunei, Singapore, South Korea, Canada, New Zealand, China, Mexico, Chile, Vietnam, Peru, Russia, Papua New Guinea, Hong Kong, and Taiwan. 6. After 19 years since the first APEC summit in the Philippines, we can readily say that the promised heaven under APEC and ‘globalization’ failed to materialize. 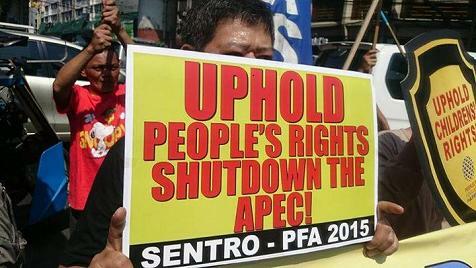 But more than this, we have to look at the role played by APEC in what happened after. 7. APEC impelled an economy based on an economic growth that favored only a small number of landed elite and capitalists in the country. It fosters exclusive growth that marks a growing gap between those who have access to wealth and resources those who have not. This is a type of economic growth that is possible only through increased exploitation of the working class and the wanton abuse of the country’s environment and natural wealth.